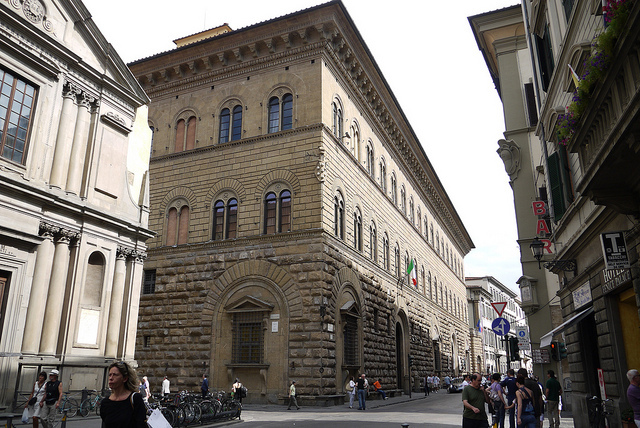 Palazzo Strozzi was the champion of Florence’s millionaire palaces, a rusticated stone cube of such fearful dimensions that it squats in its own piazza just up from Via de’ Tornabuoni like the inscrutable monolith in 2001: A Space Odyssey, radiating waves of megalomania. It was begun by Benedetto da Maiano in 1489 for the extraordinarily wealthy Filippo Strozzi, head of one of Florence’s greatest banking clans and adviser to Lorenzo il Magnifico. When he died in 1491, the façade facing Piazza Strozzi was almost complete, but future generations had neither the money nor the interest to finish the massive cornice. And one wonders whether his son, also called Filippo, ever took much pleasure in it; although at first a Medici ally like his father and wed to Piero de’ Medici’s daughter, Filippo later led a band of anti-Medici exiles against Florence. Captured and imprisoned in the Fortezza da Basso, he stabbed himself, while many other Strozzi managed to escape to Paris to become bankers and advisers to the king of France. There are few architectural innovations in the Palazzo Strozzi (it was completed after 1497 by Simone del Polliolo but here the typical Florentine mansion is blown up to the level of the absurd: although it has three storeys like other palaces, each floor is as tall as three or four normal ones; even the rings for tying up horses are big enough for elephants. Like Michelangelo’s David, Florence’s other beautiful monster, it emits what Mary McCarthy called the ‘giganticism of the human ego’, the will to surpass not only antiquity but nature herself. But the Strozzi, it turns out, were only pikers in the ego stakes; in spite of its enormous dimensions, their Ponderosa could fit neatly into the courtyard of the Pitti Palace.